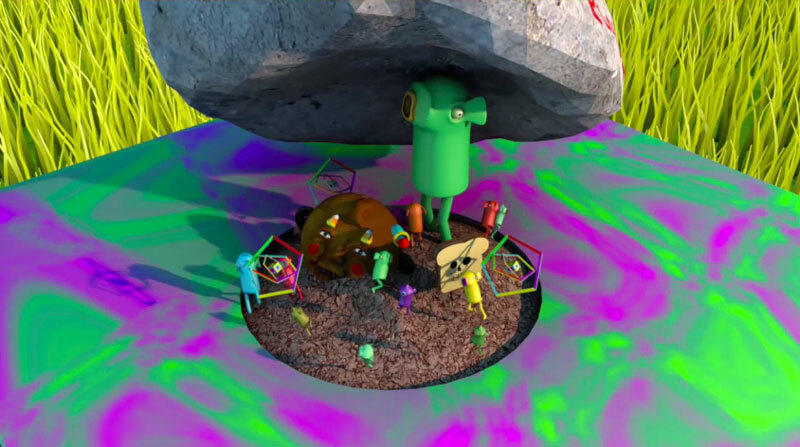 To produce this irreverent but strangely meditative video, two Toronto collectives — the illustration and fine-art group Team Macho and DSP Work Archive, a video, comics and theatre outfit — joined forces to form a “super collective.” Where Are Caves? addresses themes of privacy and solitude… and also features people with buckets on their heads and a giant animated cat, images that have a way of lingering in the mind long after the end of the video. It’s truly like nothing you’ve seen before. This video is part of The Collective, a CBC Arts digital project that invites artists to tell their own stories. For starters, can you walk us through the video’s concept? What’s the deal with these “caves”? Well, it’s up for interpretation. The core conceit of it was just language experimentation; using nonsensical phrases is something we do for fun. But it’s also about privacy. In the modern world, everyone’s on their phone; everyone’s always on Facebook and Twitter and YouTube. Where does solitude exist now? You actually can’t go to a place where you can be quiet and alone and relaxed. And people come up with faux holistic alternatives to that situation; like maybe you can replicate that feeling by putting a bucket on your head and pretending you’re in a cave. So in a sense, the caves symbolize that empty place where you can go and be alone. The video’s voiceover almost feels like the narration in a planetarium show, or a meditation tape. What were you hoping to evoke with that? We wanted to experiment with the language of a ‘self-help’ aesthetic. The narration sounds like a tape or a CD that you might listen to to help you relax — but the content itself is actually not relaxing. We also wanted to give the video the feel of an educational piece; something you’d be shown in a classroom. That meditative tone, juxtaposed with this voice of authority telling you what to think: it’s a little sinister, a little “cult”-y. Which we thought could be fun to play around with. Nonsense seems to play an important role in your art. How does the ‘absurd’ factor into your artistic ethos? Experimental, abstract humour — whether it’s nonsense or a weird body movement or a strange noise — is at the core of our philosophy. It isn’t about taking a stance; it’s more just about trying to achieve true, honest laughter in its most distilled form. Our collaboration with Team Macho made sense, because we’re generally focused on that surreal or experimental comedic content. We are performance and video artists, and they are more visual artists — they’re known for their paintings. But truthfully, we wouldn’t have been able to do it if we didn’t collaborate. Your collectives came together for this project to form a “super-collective”… What was that experience like? Collaboration is a lot of fun. You can draw pictures alone or make videos alone, but when you do it with your closest friends, it’s more enjoyable. And on top of that, you may get better ideas in the end, because you’ve got other people around you checking in and making suggestions. It was a lot of building up and tearing down and building up again. As long as everyone only cares about making the content as good as it can possibly be, it’s very positive. What do you hope people will take away from the video? In the end, there’s this idea that people are craving this isolation and a quiet place where they can go to be alone. But you can’t occupy a space where nobody else is. We live in communities, we live in society. In the end, the one cave moves over, and there are several caves moving around in the same space. You kind of have to embrace this, even if you don’t like it, because you can’t get away from it. The video is vague enough to be interpreted in different ways. But hopefully there’s enough of that core concept peppered in it to start a conversation.